Context: The use of antioxidants immediately after bleaching showed increased bond strength. Aims: This study aimed to compare the effects of natural antioxidants on the shear bond strength of composite resin to bleached enamel. 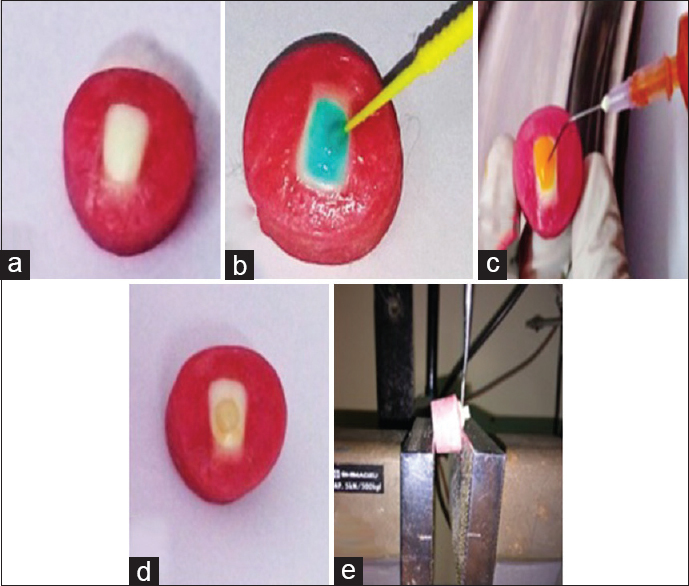 Materials and Methods: Fifty extracted single-rooted upper incisors were decoronated by sectioning the roots 2 mm below the cementoenamel junction, and then, crowns were embedded in autopolymerizing acrylic resin block (3.0 cm × 3.0 cm × 3.0 cm) with the labial surface exposed. They were randomly divided into five groups, depending on the type of antioxidant used (n = 10): (i) Group 1: control (no bleaching), (ii) Group 2: bleaching only, (iii) Group 3: bleaching + 10% sodium ascorbate (antioxidant), (iv) Group 4: bleaching + green tea, and (v) Group 5: bleaching + white tea. Labial surfaces of 40 teeth were bleached with 38% hydrogen peroxide for 20 min following manufacturer's instructions. After that, the experimental groups (Groups 3, 4, and 5) were treated with respective antioxidant solutions before composite restorations were done using a cylindrical plastic mold (3 mm × 5 mm). Shear bond strength of the specimens was tested under universal testing machine. Statistical Analysis: Data were analyzed with ANOVA and Tukey's post hoc test. Results: There were statistically significant differences between shear bond strength of control groups (Groups 1 and 2) and experimental groups (P < 0.05), but no significant difference in bond strength was observed among the antioxidants used. Conclusion: Application of antioxidants immediately after bleaching showed increased bond strength. Green tea and white tea extract can be used as alternative antioxidants in improving the bond strength of enamel. A frequent reason to seek dental care is discolored anterior teeth. Discoloration of teeth is becoming a great concern as more people are conscious and aware of dental esthetics. Discolored, crooked, missing, or malformed anterior teeth can lead to important esthetic problems for patients. This often results in an effort to avoid smiling. Correction of such dental problems may produce drastic change, which often results in enhancement of appearance, self-confidence, and quality of life. Treatment options for discolored anterior teeth include the removal of surface stains, bleaching, microabrasion, macroabrasion, veneering, and placement of porcelain crowns. Lately, an increasing number of patients do not desire that their teeth be cut down for crowns. Conservative approaches, such as bleaching and veneers, are being preferred over crowns which preserve as much of the natural tooth structure as possible. Bleaching is considered an effective and conservative way to lighten the discolored teeth. It can be performed at home or in the dental office. Currently, tooth-bleaching materials are based on either hydrogen peroxide or carbamide peroxide., Despite excellent esthetic outcomes, the clinicians should be aware of the outcome of the bleaching treatment and the interactions with further dental treatments, especially additional adhesive esthetic interventions such as composite bonding, laminate veneers, or orthodontic treatment to restore the esthetic deficiencies. Reduction in enamel bond strength has become a major concern in cosmetic dentistry with regard to clinical operative procedures that involve resin bonding, such as composite veneers, or future composite restorations, where vital bleaching is often considered a first step in improving the appearance of teeth before applying a bonded restoration. SA solution is a neutral, nontoxic, and biocompatible antioxidant. Lai et al. found that the decreased enamel bond strength was returned to normal when bleaching was followed by SA treatment. In a recent study, it has been reported that grape seed extract (natural antioxidant) neutralizes the harmful effects of bleaching agent on bond strength of bleached enamel. Hence, we may extrapolate that other natural antioxidants used in medical field may have a similar effect. There are very few studies available in the literature regarding the effect of natural antioxidants such as green tea and white tea on shear bond strength of bleached enamel. Hence, the aim of the present study was to compare the effects of natural antioxidants on the shear bond strength of composite resin to bleached enamel. Fifty freshly extracted single-rooted upper incisor teeth were collected. Inclusion criteria included noncarious, unrestored teeth with no developmental defects and no visible evidence of abnormal enamel cracks. The teeth were cleaned of soft tissues and all the calculi by an ultrasonic device and stored in 1% chloramine-T solution for 7 days. Then, they were washed in running water, and prophylaxis was performed with extra-fine pumice, with the aid of rubber cups. All the samples were decoronated by sectioning the roots 2 mm below the cementoenamel junction, and then, crowns were embedded in autopolymerizing acrylic resin block (3.0 cm × 3.0 cm × 3.0 cm) with the labial surface exposed. The exposed flattened labial surfaces of enamel were prepared using 600-grit silicon carbide paper to facilitate bonding with composite. The samples were rinsed with 2 ml of 17% ethylenediaminetetraacetic acid for 1 min to remove the smear layer. After that, they were randomly divided into five groups of independent slip systems, depending on the type of antioxidant used (n = 10). Ten teeth served as the negative control group and did not receive any bleaching treatment. The remaining 40 specimens (exposed labial enamel surfaces) were bleached with 38% hydrogen peroxide (Pola Office, SDI Limited, Bayswater, Victoria, Australia) for 20 min, following the manufacturer's instructions. The bleaching gel was completely rinsed off with water spray for 60 s, and the process was repeated one more time. Group 5: Bleaching followed by treatment with 5% white tea for 10 min. The experimental groups (Groups 3, 4, and 5) were irrigated with respective antioxidant solutions for 10 min immediately after bleaching procedure. Then, the specimens were washed with distilled water for 30 s and dried. After that, the samples were etched with 37% phosphoric acid using etchant gel (Dental Ivoclar Vivadent) for 15 s, rinsed, and dried by gently dabbing a dry cotton pellet over the enamel surface. The bonding agent was applied as per manufacturer's instructions on the flattened enamel surface with applicator tip and cured. After that, nanohybrid composite resin discs (Tetric N-Ceram, Ivoclar Vivadent India) were built incrementally (1 mm) on a flat enamel surface using circular plastic mold of 3 mm × 2 mm dimension and cured using a light-emitting diode curing unit for a period of 20 s for each increment from frontal and lateral aspects. After the composite build-up, molds were removed. A universal testing machine (Autograph Universal Testing Machine, IICT, Hyderabad) was used for measuring the shear bond strength at the interface of enamel and composite resin [Figure 1]. The shear bond strength was measured in shear mode at a crosshead speed of 0.5 mm/min until fracture occurred. Data were analyzed using ANOVA and post hoc tests [Table 1] and [Table 2]. Statistical significance was set at P < 0.05. There were statistically significant differences between shear bond strength of control groups (Groups 1 and 2) and experimental groups, i. e., P < 0.001. Among the antioxidants used, Group 3 showed higher bond strength, followed by Group 5 and Group 4. However, no significant difference in shear bond strength was observed among the antioxidant groups. The mechanism of action of bleaching agent relies on a complex oxidation reaction that releases free radicals as nascent oxygen when applied to dental structure. These molecules (hydrogen peroxide or carbamide peroxide) react with the electron-rich region of the tooth, breaking down large-pigmented molecules into smaller less-pigmented ones and thereby eliminating the stain. Depending on the type and extent of stains and discoloration, the treatment varies from bleaching to veneer or bleaching with direct/indirect composite/ceramic veneer. In few cases, bleaching may be successfully attained. However, when stains are not responsive to bleaching, they should be either removed by abrasion or masked by a restoration. These cases would need esthetic restorations that mandate the employment of a bonding technique. However, immediate bonding of resin after bleaching procedures decreases the bond strength of composite restoration., This can be probably to be caused by delayed release of oxygen or presence of residual peroxide that interferes with the resin tag formation and inhibits the resin polymerization. To reduce such clinical issues associated with postbleaching, various techniques have been proposed. Wait for 1–4 weeks after the bleaching procedure. To avoid the above-mentioned limitation, antioxidants have been tried. Lai et al. found that compromised bond strength of composite resin can be reversed with the use of antioxidants such as SA following bleaching.,, SA is known to be an effective antioxidant and has the ability to remove the residual peroxide and oxygen so that compromised bonding to bleached enamel could be reversed. It is nontoxic, easily available, unlikely to have any local or systemic hazards, and economical. Green tea and white tea are well-proven antioxidants and are gaining popularity by virtue of being herbal and natural. There are limited evidence and information on their efficacy as antioxidants after bleaching. Therefore, in the present study, SA was compared to green tea and white tea. The antioxidants used are presented in powder form and made into solution by adding water. Another antioxidant, green tea is made from Camellia sinensis leaves. The main antioxidative ingredients present are green tea catechins (GTCs) that comprise four major epicatechin (EC) derivatives; EC – 6.4%, epigallocatechin (EGC – 19%), EC gallate (ECG – 13.6%), and EGC gallate (EGCG – 59%). EGCG is the most active and abundant catechin present in the green tea, which is a water-soluble and a safe material with the ability to destroy free radicals. Previous studies have shown that GTCs possess potent antioxidant activity several times higher than that of Vitamin C (ascorbic acid) and Vitamin E. In the present study, 5% green tea extract for 10 min (Group 4) increases bond strength significantly compared with Group 2. This might be attributed to the antioxidant potential of polyphenols in green tea and is directly associated with its structure that is the hydroxyl groups that cause the binding and neutralization of free radicals. The results concur with the previous studies. White tea has a similar mechanism as green tea. However, it has more antibacterial and antiviral properties than green tea because of a higher antioxidant content. In the present study, 5% white tea extract for 10 min (Group 5) increases bond strength significantly compared with Group 2. This might be attributed to the antioxidant potential of catechins present in the tea. However, there is no statistically significant difference in the antioxidant potential of green tea and white tea. Previous studies have shown 5% green tea extract to be an alternative substance to restore the reduced shear bond strength in bleached enamel using an in-office technique. Therefore, the concentration used in the present study was 5% green tea and white tea (5 g of tea per 100 ml of water). Lai et al. showed that reversal of reduction in bond strength of resin to enamel was achieved within 1 h of use of the antioxidant. Türkün et al. showed that even 10 min application time was enough for reversing the reduced bond strength. Therefore, in the present study, 10-min time was used for antioxidant application. The results of this study showed that the shear bond strength of Group 1 (unbleached group) is significantly greater than that of Group 2 (bleached group). This finding is in accordance with the previous studies. Furthermore, the shear bond strength of the bleached group (Group 2) is significantly lower than all the other groups. This implies that the employment of antioxidants increases the bond strength to bleached enamel, which was similar to the former studies. There were statistically significant differences between shear bond strength of control groups and experimental groups (P < 0.05). However, there were no significant differences among the antioxidant groups, and all the antioxidant solutions used were equally effective. Within the limitations of the present in vitro study, it may be concluded that the bleaching of enamel reduced the bond strength. Hence, the use of antioxidants immediately after bleaching showed considerably increased bond strength. Green tea and white tea extract may be used as an alternative antioxidant in reversing the bond strength of enamel. Amarlal D, Rayen R, Muthu MS. Macroabrasion in pediatric dentistry. J Clin Pediatr Dent 2006;31:9-13. Korkut B, Yanıkoǧlu F, Günday M. Direct composite laminate veneers: Three case reports. J Dent Res Dent Clin Dent Prospects 2013;7:105-11. Roberson T, Heymann H, Swift ED. Sturdevant's Art & Science of Operative Dentistry. 5th ed. St. Louis: Saunders Elsevier; 2011. Bulut H, Kaya AD, Turkun M. Tensile bond strength of brackets after antioxidant treatment on bleached teeth. Eur J Orthod 2005;27:466-71. Türkün M, Celik EU, Kaya AD, Arici M. Can the hydrogel form of sodium ascorbate be used to reverse compromised bond strength after bleaching? J Adhes Dent 2009;11:35-40. Gökçe B, Cömlekoǧlu ME, Ozpinar B, Türkün M, Kaya AD. Effect of antioxidant treatment on bond strength of a luting resin to bleached enamel. J Dent 2008;36:780-5. Titley KC, Torneck CD, Smith DC, Chernecky R, Adibfar A. Scanning electron microscopy observations on the penetration and structure of resin tags in bleached and unbleached bovine enamel. J Endod 1991;17:72-5. Bittencourt ME, Trentin MS, Linden MS, de Oliveira Lima Arsati YB, França FM, Flório FM, et al. Influence of in situ postbleaching times on shear bond strength of resin-based composite restorations. J Am Dent Assoc 2010;141:300-6. Cvitko E, Denehy GE, Swift EJ Jr., Pires JA. Bond strength of composite resin to enamel bleached with carbamide peroxide. J Esthet Dent 1991;3:100-2. Benjamin S, Sharma R, Thomas SS, Nainan MT. Grape seed extract as a potential remineralizing agent: A comparative in vitro study. J Contemp Dent Pract 2012;13:425-30. Sharafeddin F, Motamedi M, Modiri SH. Effect of immediate application of pomegranate peel, grape seed and green tea extracts on composite shear bond strength of in-office bleached enamel. Res J Biol Sci 2013;8:83-7. 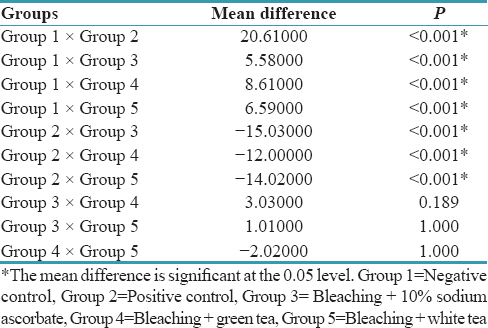 Patil J, Reddy A, Venigalla BS, Shekar K, Ravichandra C, Binoy D. Effect of different concentrations of carbamide peroxide and green tea extract on the color and shear bond strength of enamel – An in vitro study. Endodont 2015;27:129-35. Ayar MK, Yildirim T. Effects of Er, Cr: YSGG laser pulse frequency on microtensile bond strength to enamel. Oper Dent 2017;42:53-61. Berger SB, De Souza Carreira RP, Guiraldo RD, Lopes MB, Pavan S, Giannini M, et al. Can green tea be used to reverse compromised bond strength after bleaching? Eur J Oral Sci 2013;121:377-81. Sung EC, Chan SM, Mito R, Caputo AA. Effect of carbamide peroxide bleaching on the shear bond strength of composite to dental bonding agent enhanced enamel. J Prosthet Dent 1999;82:595-9. Barghi N, Godwin JM. Reducing the adverse effect of bleaching on composite-enamel bond. J Esthet Dent 1994;6:157-61. Torneck CD, Titley KC, Smith DO, Adibfar A. Effect of water leaching the adhesion of composite resin to bleached and unbleached bovine enamel. J Endod 1991;17:156-60. Kimyai S, Valizadeh H. The effect of hydrogel and solution of sodium ascorbate on bond strength in bleached enamel. Oper Dent 2006;31:496-9. Torres CR, Koga AF, Borges AB. The effects of anti-oxidant agents as neutralizers of bleaching agents on enamel bond strength. Braz J Oral Sci 2006;5:971-6. Mazaheri H, Khoroushi M, Shafiei E, Ghorbanipour R, Majdzade F. Bond strength of composite-resin and resin-modified glass ionomer to bleached enamel: Delay bonding versus an antioxidant agent. Indian J Dent Res 2011;22:432-5. Bornhoeft J, Castaneda D, Nemoseck T, Wang P, Henning SM, Hong MY, et al. The protective effects of green tea polyphenols: Lipid profile, inflammation, and antioxidant capacity in rats fed an atherogenic diet and dextran sodium sulfate. J Med Food 2012;15:726-32. Cabrera C, Artacho R, Giménez R. Beneficial effects of green tea – A review. J Am Coll Nutr 2006;25:79-99. Stokes AN, Hood JA, Dhariwal D, Patel K. Effect of peroxide bleaches on resin-enamel bonds. Quintessence Int 1992;23:769-71. Titley KC, Torneck CD, Smith DC, Adibfar A. Adhesion of composite resin to bleached and unbleached bovine enamel. J Dent Res 1988;67:1523-8.